I do love a bowl of Asian soup, in its many forms, in fact it’s one of my favourite meals – I’ve had many kinds, in many places, and really can’t ever remember having a bad one. The motivation for making this one yesterday was the discovery of some left over cooked turkey from Christmas lurking in the bottom of my freezer, and the desire to do something a bit different with it. The soup I made doesn’t follow any kind of traditional recipe, I used this recipe to make the wrappers for the wontons (which I think is a fairly standard wonton wrapper recipe), and looked online for how to shape the wontons, but aside from that I just made it up as I went along (apologies that half the recipe is in cups, and the other is in weight!). 1. Make the wonton wrappers by sieving the flour into a bowl. Make a well in the centre. Whisk the egg, salt and 1/4 cup water together and pour into the flour. Use a fork to bring it together. Add more water if needed. You’ll need to get your hands in there eventually and make it into a ball. You don’t want a sticky dough, so take care not to add too much water. Knead the dough on a lightly floured surface for a few minutes until it is smooth and pliable, then wrap it in cling wrap and leave it to rest for at least 30 minutes. 2. While the dough is resting, make the filling. Finely chop the mushrooms (roughly 1/2 cm size pieces) and saute them in a little butter until the liquid has come out from them and then evaporated, add the crushed garlic in for the last minute of cooking. Finely chop the turkey and the spring onions. 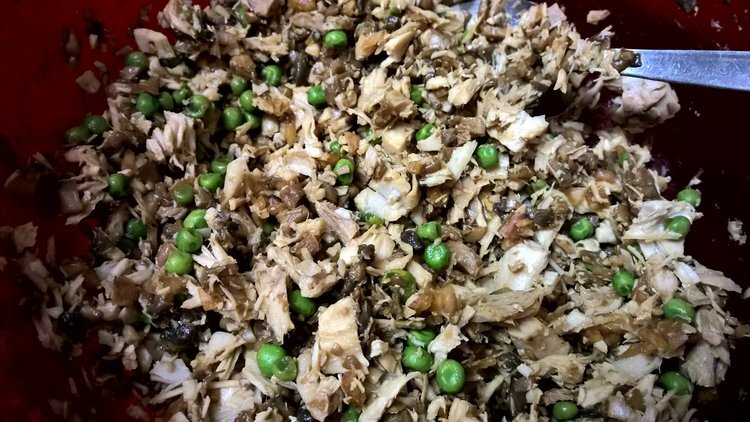 Mix the turkey, spring onions, cooked mushrooms and garlic, peas and teriyaki sauce together and set aside. 3. Divide the dough into two or three, keeping the unused part wrapped until ready to use. On a lightly floured surface, roll dough out as thinly as you can – it’s quite a strong dough so you can really go for it without it tearing. Cut it into squares 3.5 inches by 3.5 inches (I used a ruler and a pizza cutter). Repeat with the rest of the dough. If you’re in a warm environment, then cover and refrigerate the squares for a while before use. Repeat until done. I ended up with 27 wontons, and a little mixture left over (I used the left over mixture in an omelette the following day). Incidentally, you could freeze the prepared wontons at this stage, and drop them into soup stock straight from frozen at a later date. 5. In a large pot, bring the chicken stock up to a light boil, add the soy sauce, hot pepper sauce and chinese five-spice. Check the seasoning levels and add more if needed. 6. Peel the carrots and then turn them into ribbons using your peeler. Wash and thinly slice the bok choy. Add the vegetables and the cooked turkey into the stock. 7. Bring a separate pot of water to the boil, drop the wontons in and cook for about 5-6 minutes, when they rise to the top of the water, they should be done. Remove them with a slotted spoon. 8. When the vegetables in the soup are just tender, add the wontons in and simmer for a couple more minutes. 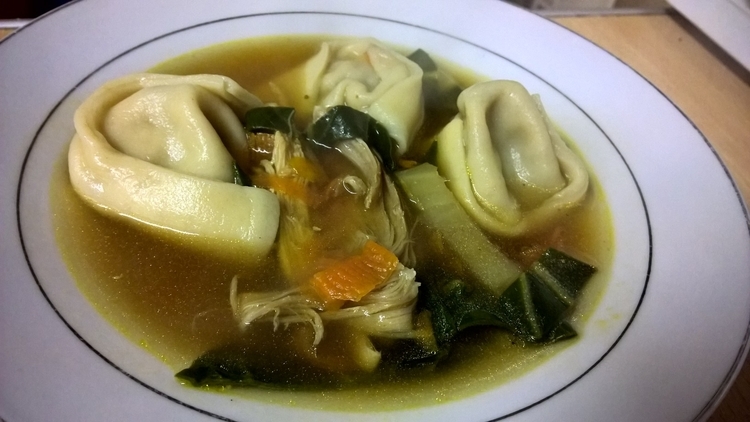 Sometimes wonton soup can be a bit underwhelming, but this looks fantastic. Visually looks great and the filling sounds fantastic. Thanks for the recipe! 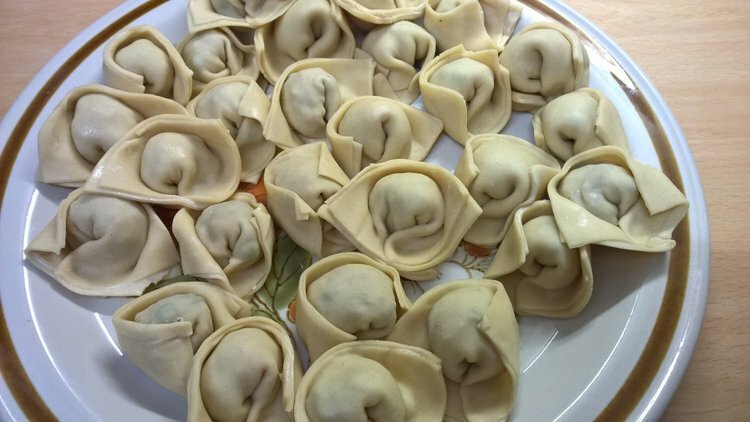 I imagine such fresh, homemade wonton wrappers make this particularly yummy. I’ll have to consider this one if I have some extra time on my hands. Looks delicious! Yes, it did taste nice and fresh. The most time consuming element was actually rolling out the dough, to get it thin enough and even. 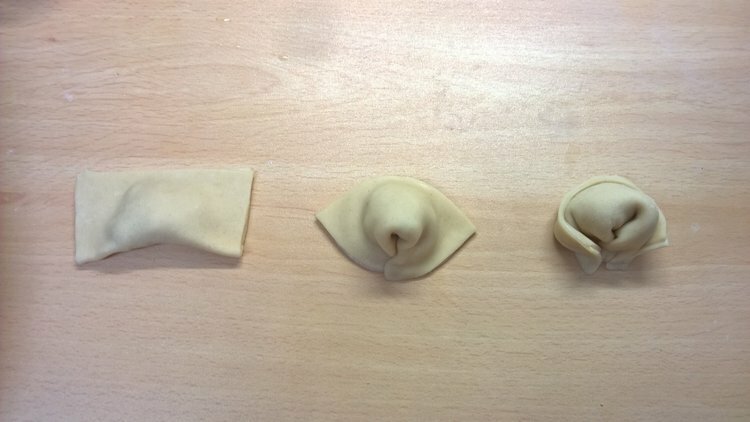 The filling and shaping of the wontons was much easier and quicker than I was expecting. This is a really easy one …. to eat! Yummy!! Oh, I don’t know about THAT, Vanessa. I wasn’t that hungry but I did eat. I’m sure your soup is delicious. I LOVE wonton soup…never actually thought of making it myself for some reason. This looks so yummy! I’m moving to England just so I can eat all this yummy food you make! I’ll be there in 5! This looks delicious—although I’ve never been good at rolling out any kind of dough to the right thickness! With this one you really just keep going until you can’t stretch it any more, it takes a while, but it doesn’t split or break! I like the idea of making the wontons ahead of time and freezing them. Cuts down on the amount of prep time when you choose to serve this dish — and I’m all about time management! Yep definitely, or to just make a double batch, half now and half in the freezer for another day!